16 Dec Supreme Court short order was an expected response of superior judiciary. Federation and all provinces through their lawyers jointly consented to its repeal, and none came to rescue the beneficiaries and even academic discussion was not made possible on the topic of powers to issue and right course of action to dispose off a bad law. 342 members of the Parliament jointly expressed their unwillingness to discuss and vote out this notorious ordinance despite the fact that it relates to them and their future on the whole as a club, and any order would have far reaching implications on the future of their brethrens good or bad. In that situation, what do you expect from judges. “Overall, a welcoming order, full of happy tidings, but similar amount of flaws, unaddressed anomalies, and legal circles expect a lot more explanation in detailed judgement, and I hope the order does the job in the end. This order is also reflection of various ‘compulsions’ under which Pakistani society goes through daily. The short order incites that there is more to come, and a detailed judgement will open a lot of avenues for further litigation. On the outset, Superior Court is mindful of the limitations they are working under and one can say that the decision has set the track on which SC is likely to go in near future. However, it is not a final decision, this is part of a series of decisions we must expect in the days to come”. I just returned from a wedding and I got an icky feeling about the lawyer leaders. I saw some there. 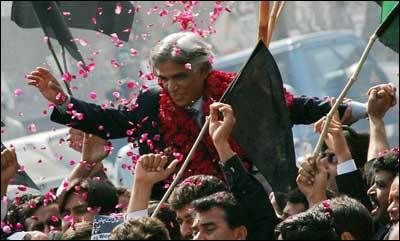 I caught a glimpse of Aitzaz, but before I could get my glamor shot with him, he had shot off to another function. I support the movement and its leadership. I support the support they got from the roots, and the movement’s progressive thrust. But there is an ickiness, and I know these leaders aren’t the radical, or even the clean hearted hippies I wish them to be. In fact some of them have only recently reignited that radical spark form the students’ movement of the 60s after years of real estate work. Some of them have vested interests. But I already knew that, and its not naivety that you accept flawed individuals, but pragmatism that you suspend your judgment as they invigorate a movement — as leaders. And learn. Hence, CJ as a symbol, as a trigger, as a mascot, as an illustration of resistance is fine – an impeccable judge or fashion model he may not be – but I’ll take the missing persons cases and applaud him anyway. So I reserve my judgment, and hope that institutional changes are made, and the good decisions keep us afloat. The movement won, and the people are happy. But not really. The judges were restored, but there is a constitutional problem that’ll make your head spin. As a friend in the movement tells me, there are 4 categories of possibly illegal judges – the level of their illegality depends on when the took the jinxed oath. 1) those who were judges on Nov 2 and accepted the PCO on Nov 3; 2) the new appointees under Mush; 3) the new appointees under Zardari; 4)those amongst the 43 judges of the Nov 2 who held out for months, and then when the movement waned, they took a cynical fresh oath. Update: CJP Flag Hoisting by Naheed Khan & Safdar Abbasi? It was precisely 505 days since that fateful day on November 3rd 2007 when General Pervaiz Musharraf overthrew a sitting Chief Justice and replaced him with an illegally sworn judge. On Sunday 22nd March the Chief Justice Iftikhar Muhammed Chaudhry will be reinstated and to celebrate the momentous occasion the official flag will be hoisted at his residence at 11:00AM in the morning. It should have been a momentous occasion to celebrate the activists who helped the reinstatement. Now as the Chief Justice is about to resume his work, it is reported in the press that Barrister Aitzaz Ahsan has taken it upon himself to hold a flag hoisting ceremony at the Chief Justice’s house. Talking to media he has said that political parties have been invited to participate in the ceremony while Naheed Khan, Safdar Abbasi and Shaharyar Awan (son of late lawyer leader Imdad Awan) are to hoist the flag. One does have to wonder why such individuals have been picked by Aitzaz, to have selected people who have practically done little to help the reinstatement of the CJP Iftikhar. 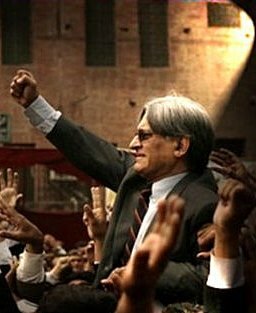 It seems more like a move by Aitzaz for political salvation amongst the potential PPP-breakaway faction, if for nothing else. Today when I reached Sindh High Court Bar in the morning, I that the Police were hurdling protestors of JI and Qadir Magsi’s STP in Police vans. Still many defiant activists of JI and STP kept on pestering the police, who used to charge towards them after every few minutes. There were many policemen in plain clothes today as well. After sometime, around 100 lawyers came out of the High Court. Then other activists from LPP and Awami Tehreek also joined in. I along with my fellow IS members also joined in this procession, which started to swell. We marched from Sindh High Court/Passport Office to the Bus Stop near Rainbow Centre, Saddar. There everybody got organised and got into there respective cars and buses. IS members also got into their cars. And from then on, the procession was great. We went from Quaid’s Mazar to Islamia College, to Jail Chowrangi to NIPA, to Gulshan Chowrangi to Sohrab Goth. It was at Sohrab Goth when we got out of our cars for a little while and chanted slogans and what not. It was great to see the familiar faces of Salahuddin and Noman Qadir (they helped us a lot during the last march till Islamabad). We crossed Al-Asif and were going smoothly when one of cars developed a problem. In preparation of the Long March section 144 was imposed in Lahore on Tuesday for three days effective from Wednesday. The following was written on 28th February – before the “mobile justice” Presidential Ordinance (finally withdrawn on 3rd March) and before the attack on the Sri Lankan national cricket team – in response to the promulgation of Governor’s Rule in the Punjab and the official obstruction of the Punjab Assembly sessions by the provincial executive authority. Why does the dis-qualification of the incumbent CM lead to the siege of the PA by the police? Imposition of Governor’s Rule – even if ordered by a democratically elected government – is an attack on democracy, on the right of the people to govern themselves through freely elected representatives. A simpler alternative would have been for the PPP to have said that decisions of the judiciary were not in its control, that they valued the alliance with the PML-N and that they would encourage the PML-N to pursue the case through proper channels – for example, the appeals process. Why do our civic liberties (freedom of speech, freedom of association, etc.) suffer because of a quarrel among the power elite? Democracy needs to be allowed to take root and the anti-democratic measures taken by the central executive authority – imposition of Governor’s rule, disruption of normal proceedings at the provincial assembly – at such a sensitive time may provide just the right conditions (dissatisfaction with performance, overwhelming disapproval of government actions, power vacuum) for the Army to carry out yet another coup. These two points taken together lead to criticism of both the PPP and the PML-N’s handling of the situation: Given the incredibly fragile condition of democracy in Pakistan, it is quite irresponsible of PML-N and PPP not to have worked out a better power-sharing formula. Irresponsible or simply incompetent. Some would say that it was impossible, that the rupture was inevitable. We simply do not have enough information but if some day the story of the behind-the-scenes negotiations between June 08 and February 09 comes out, it may well reveal missed opportunities and/or lack of vision on the part of our “leaders”. A 100g roti need no longer be sold at Rs. 2 – the price ceiling was removed the day after the so-called Supreme Court handed down its disqualification ruling. Why should the completely de-politicised and alienated poor pay the price of a power struggle? COME LISTEN TO SOME OF THE LEADERS WHO HAVE BEEN AT THE FOREFRONT AS THEY TRACK THE HISTORY OF THE MOVEMENT AND DISCUSS TRUTHS, MYTHS and REALITIES. The PPP’s Central Executive Committee membership of Chaudhry Aitzaz Ahsan has been suspended and a show cause notice, over violation of party discipline, has also been issued to him. Secretary Pakistan Peoples Party Jahangir Badar said that the members of PPP’s Central Executive Committee unanimously made this decision as Chaudhry Aitzaz Ahsan violated party discipline. On 28 March 2008, when Chief Justice Chowdhary visited Mr. Zardari to pay condolences over the death of Be Nazir Bhuttoo, the writer wrote as following, “It’s an ill advice of half lawyer half politician leaders who sometimes are trapped in between party loyalty and the cause of independence of judiciary and forget that judge’s reinstatement is not an issue at all, the issue is their complete autonomy and independence. With this speed the way things are developing, we may get the jobs of those judges back but the process may affect the capacity of top judge to dispense justice on equality basis”. The writer in his thesis recommended to form a committee and wrote, “People of Pakistan did not lay their lives to see a judge visiting the rulers which may seem an exercise to clear reservations or settle terms in order to seek his job back, its vice versa people want the rulers to come at the door step of the top judge who must be acknowledged for his steadfastness, bold stand and bravery and masses do not want the reinstatement of justice Choudhary, if it is not with full pride and honour, but they want to see the restoration of the prestige of the office of the chief justice who was detained with family, ill treated, and mal handled by state functionaries and law enforcement segments. It will be quite in the interest of ruling party to take the lawyers struggle down by slowly defusing the popular slogan of reinstatement and or bending the top man, however with wisdom, consultation and pride these tactics can be defused and jurist committee is a step towards right direction”. Though my writing went beyond notice and we had a long march without results. On the fall of long March 08, the writer on 16 June expressed his views and wrote in his column that, “ Lawyers are different from others only because they consult, take advice from seniors and agree to disagree on all major issues of principle. It also gives a lesson that with fiery speeches you may get applause but judiciary does not get independence. It requires sheer political will, joint collaboration and consultation in the national interest, wisdom and sacrifice which is pre requisite to translate this dream into a reality. May be consultation is the key which needs to be mastered in coming days by lawyers”. Ali Ahmed Kurd yesterday won the elections of the Supreme court Bar Association with a landslide victory uprooting Mohammed Zafar. After the landslide victory Kurd and his entire panel will replace the team of Barrister Aitzaz Ahsan, and hopefully continue the aggressive campaign for the independence of judiciary. For the people supporting the rule of law and the independence of Judiciary over the last two years this is definitely a moment of hope to witness that many lawyers still support the movement despite all the negativity over the last years and attempts by many smaller faction to create a rift within the SCBA. PBC suspends lawyers: What Musharraf could not do! The Pakistan Bar Council (PBC) has suspended the practicing licences of advocates Mahmood Ashraf and Rana Naveed, President and General Secretary, respectively of the Lahore High Court (Multan bench) for allegedly misbehaving with Latif Khosa, Attorney General of Pakistan, who also acts as an ex-officio Chairman of PBC. The PBC also restrained them from functioning as office bearers and operating the Bar accounts. According to details, High Court Bar Association of Multan had banned Sardar Latif Khosa’s entry in Multan High Court Bar in a meeting of ‘General House’, yet he arrived at High Court Bar accompanied by lawyers belonging to People’s Lawyers Forum. 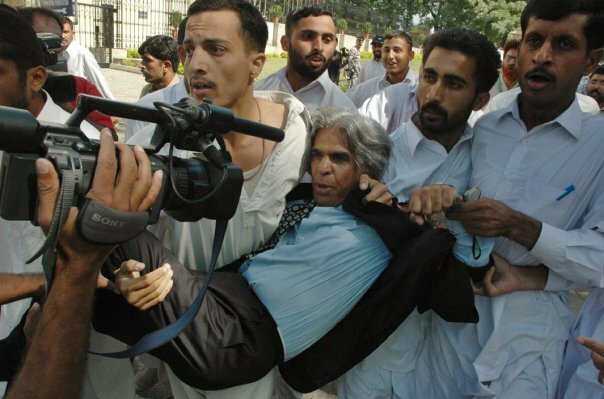 The Secretary Bar, Rana Naveed and some other lawyers objected to Khosa’s presence there and ask him to leave and started to chant slogans demanding restoration of Chief Justice of Pakistan, Ifthakhar Muhammad Chaudhry.